At Fessenden, we believe students benefit in myriad ways from studying a second (or third) language. In fact, you can often find our youngest learners exploring Spanish in our Pre-K and Kindergarten classes. Throughout the year, children in our earliest grades expand their cultural awareness, reinforce fundamentals (such as math and literacy), and have fun along the way. There are a number of research-supported ways that learning a second language in preschool improves the way students think. If you’re a parent, you know that young children, especially around the ages of three and four, are like sponges. They absorb everything you say and do, and they often emulate your language and behavior (sometimes to your embarrassment or dismay). It’s no secret that preschool-aged students are building a foundation for learning that will serve them later in life. Given their natural ability to acquire information, it is a perfect time to learn a second language. You’re probably familiar with the claim that the older you get, the harder it becomes to learn a different language. Perhaps you’ve even experienced this firsthand. Researchers support this theory and believe that the optimal age for a person to master language acquisition skills is around three or four. In a 2004 study, bilingual and monolingual students were asked to participate in a computer-based sorting and matching game involving colored blocks with varying shapes. Students who spoke a second language were able to perform the task at a faster pace than those who spoke one language. Similar studies have shown a marked difference in students who are bilingual—they are generally better at multitasking and retaining information. Studies at the Cornell Language Acquisition Lab (CLAL) support this sentiment, arguing that children who learn a second language can maintain focus when faced with distractions better than children who know only one language. There are many brain-based advantages to learning a language at age three or four. Young children who are immersed in new languages display enhanced problem-solving skills, increased creativity, and show a hunger for seeking new ideas and new ways of looking at the world. And, as they grow older, they often become more easily connected to a global society in which languages and cultures intersect. What Does Learning a Second Language Look Like in Pre-K and Kindergarten? We know that young children learn by listening, seeing, imitating, and practicing. In addition to our core academic program, we offer “specials,” which are electives taught by experts in each subject. Fessenden’s Spanish teachers utilize a multitude of approaches when it comes to educating our youngest students, including oral presentations, pictures, songs, games, and group and individual activities. We are sure to incorporate movement—which can be extremely beneficial for boys—and we always strive to make things fun. 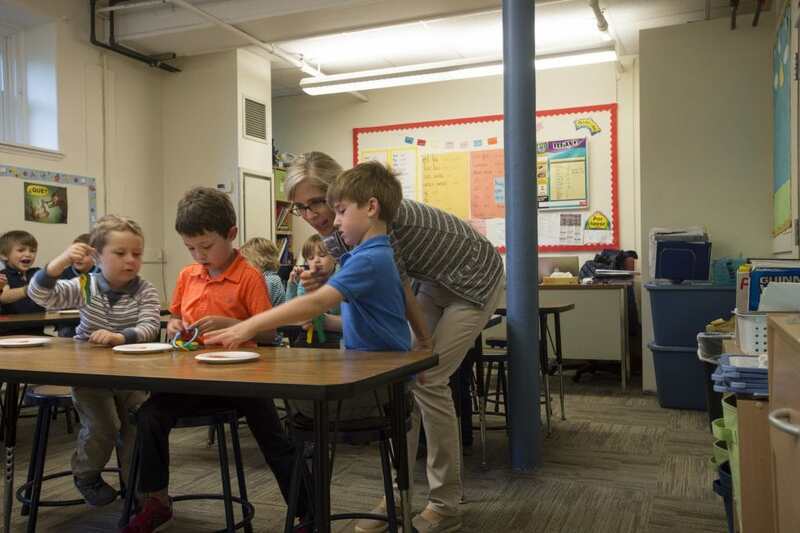 Learning a new language in Pre-K and Kindergarten sets the foundation for a child’s elementary and middle school years at Fessenden, where they will have the choice of studying Spanish, or Latin. Are you bilingual? Is learning a second language something you’d like to prioritize for your preschool-aged child? Pre-K Specials: What Are They and Why Are They Important?